What is superelevation in road design? Home › Advice › What is superelevation in road design? Superelevation is used to create banking on corners. It’s where the whole road slopes one way, usually towards the inside of the bend. It’s also called positive camber, whereas if the road slopes away from the inside, or the apex, it’s called adverse camber. Superelevation enhances a vehicle’s steering performance. You see it most notably on banked race tracks like Indianapolis Motor Speedway where the banking is just over nine degrees or Talladega Superspeedway with banking of 33 degrees! 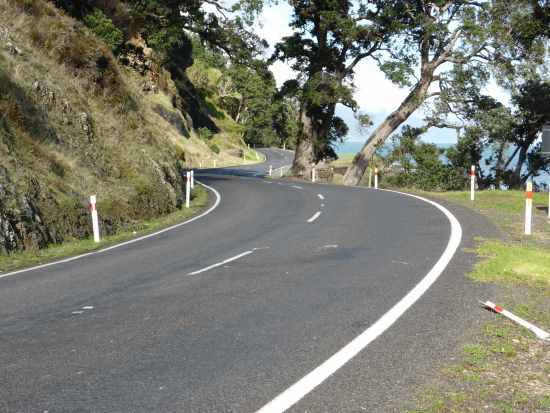 Roads that are relatively fast but switch direction unexpectedly are likely to have roads cambered with superelevation. You can see it particularly with the second bend that turns to the right. Fast changes like this create a ‘crown’ that crosses the road diagonally as the camber direction changes from left to right. The reason it works is because when a vehicle turns a corner, physics means that it fights against the urge to carry on travelling straight ahead. By banking the road, more of the force is taken up through the suspension and less by the tyres, therefore a vehicle can go faster before the tyres begin to skid. Superelevation benefits vehicles travelling in both directions because it increases their cornering ability. If the road was cambered like a straight piece of road (higher in the middle) it would only benefit vehicles travelling closest to the inside or apex of the corner. Usually a road has a longitudinal crown in the centre – this is the high point of the road – and the road slopes away towards the edges. However, if the road has a lot of heavy vehicle traffic it can form long depressions along the tyre tracks which fill with water. These create an aquaplaning hazard and also increase fuel consumption because of the extra drag on vehicles’ wheels. ‹ Can you drive with eyesight problems? Can you drive with eyesight problems?